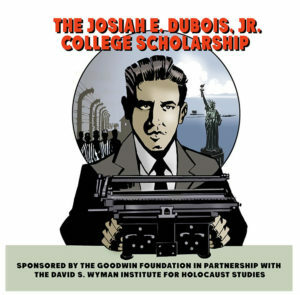 The David S. Wyman Institute for Holocaust Studies is a 501(C)(3) organization, and all contributions to it are tax-deductible. We rely entirely on our supporters to fund our educational programs and other activities. Please donate today, and support our mission to teach the lessons of the Holocaust to future generations. Written by Rafael Medoff; illustrated by Dean Mother; edited by Mark Rothman. The year was 1939. The Nazis were on the march, and the world was teetering on the brink of war, but many Americans preferred to ignore the danger. It was up to Alan Cranston, a young journalist–and future U.S. senator–to stand up against a monstrous dictator and expose the evils of Nazism to the American public. $5.00 per copy, plus $2.50 postage for up to five copies. (For bulk rates, contact: info@wymaninstitute.org). To order this book pay here : and add your postal address, noting which book/s you are paying for. Written by Rafael Medoff; illustrated by Dean Mother. 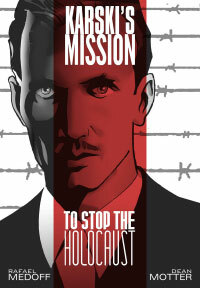 Co-published by the Wyman Institute and the Jan Karski Educational Foundation. 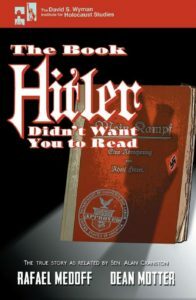 In the darkest hours of World War II, a young Polish emissary is asked to undertake a perilous mission: to bring the Free World eyewitness testimony of Nazi atrocities against Jews—by having himself smuggled into the Warsaw Ghetto and to a transit point for the Belzec death camp. To order this book pay here: and add your postal address, noting which book/s you are paying for.